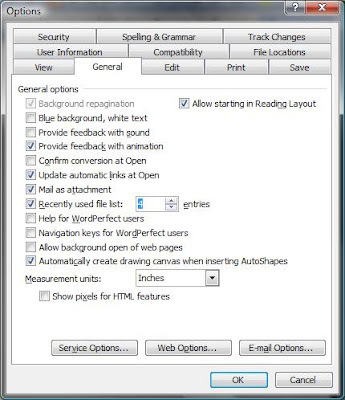 MS Word allows users to increase the number of most recently used file displayed under the File Menu (By default it is 4). You usually do this if you want Word to store your most recently opened files. But there is a limitation, you can only put 0 to 9 as values. To Change the number of recently used file list in Word, just follow these steps. 1. Click Tools Menu, then select Options. 2. On the options dialog, Go to General Tab. 3. Look for the checkbox with label of "Recently used file list" then make sure to check it. 4. Put the number of used file to list (maximum is 9). 5. Click OK to apply changes.